Everyone is aware of how the Real Estate industry operated 15 years ago. Agents controlled access to listings, the MLS carved out a competitive advantage as holder of the lock and key, and consumers had no option but to chat with a Realtor or jot down notes from a for-sale sign to engage in buying or selling a home. Then it all changed, sort of. The portals are born, ushering in the era where consumers are controlling more of their home search while, a bit unintended, the role of the agent has grown more significant, as has their use. Similar to Financial Advisors, the advising and guidance components became highlighted as the value-add to the transaction, shifting the importance from listings to education and response time. Internet 1.0 hasn’t dis-intermediated the agent from the process, but could what’s in store next meaningfully change the industry? Should it? Venture Capital firm NfX believes Market Networks are the next form of technological advance, and we believe these will take hold in the real estate industry as well. Continuing of theme that consumer control, market networks focus on creating a better workflow by establishing a platform to facilitate connections, and feature professional identities and brands. What does this mean for the Real Estate industry? How many modular tools are you using to do your job as an agent? Would a single platform that not only is shared by you and your team, but among clients, your preferred lender, leads, attorneys, inspectors, and other relevant players be helpful? How about one that encompasses the entire transaction? While the complexity of the real estate transaction won’t afford anyone the ability to buy and sell a home like they can stocks (yet, at least), there exists a marketplace, for example, between buyers and agents. A platform that facilities one side of the transaction will reduce a lot of friction in the home buying or selling process. While iBuyers are getting headlines for the liquidity they bring to the market as ready-at-all-times-buyers, a serious differentiator this model brings is the management of the entire process over a single platform. Traditional buying and selling should take note. Agent-matching sites like Abode and Homelight are building components of this by introducing a stage to create a network between the lead and agent. At Homebloq, our platform allows leads and clients to connect with an agent and search and communicate together, among others, on a broker-branded platform. According to the 2017 Home Buyer and Seller Generation Report, the three most important factors when choosing an agent were ‘agent is honest and trustworthy’ (21%), agent experience (18%), and reputation (17%). When reputation and personal identification are important components of your business, platforms that help feature your profile and brand will gain success as Millennial home buyers continue to source referrals online and do informal background checks with Google. Brokers need to be able to promote their brand, not other that of third party apps. Software-as-a-Service (SaaS) tools are already the preferred technology for businesses. SaaS apps are particularly helpful for real estate agents who are constantly on the go, need to access information via desktop and mobile, and rely on connectivity to multiple tools in order to do their job. Platforms, on the other hand, are transparent and collaborative and help not only reduce frictions in the process, but bubble up the value-add agents are doing with the work behind the scenes, like searching for and recommending properties and sharing commentary. Some of this seems very obvious, and agents and consumers are understandably frustrated when having to use a dozen different tools to accomplish what should be a seamless workflow. How and why has the Real Estate industry been held back and how can we fix it? Apple, Google= Tech. Keller, Compass = Real Estate. I really like what Keller Williams, Compass, and others are doing to invest in technology and reinvent their companies as tech companies. However, just because you develop technology and use it as part of your day-to-day business does not make you a technology company. These companies, when describing their “-ness” are service companies operating in the Real Estate Industry. The quality of their “service-ness” is what defines them. This, however, appears to be secondary for many national franchises intent on developing in-house solutions. Not unlike how the MLS’s completely whiffed on their ability to develop Zillow before it came along, real estate companies themselves should have the upper hand in developing technology (costs aside for the moment) but are failing to do so because the perspective remains an old one: build tools that benefit the brokers first, not the consumers. This is how Apple succeeded: insane focus on user experience and design ultimately carried the company to success and allowed it to capture significant market share with the iPod, simply because it looked better and was easier to use, despite the fact there were already MP3 players in the market. I believe Compass will likely struggle to maintain it’s hefty valuation, and the reviews of Keller’s tools have been suspect at best from agents with whom I’ve spoken. What needs to change for these companies to develop incredibly successful tools? The next successful tools to emerge in this space will be built not from the broker perspective, but the consumer. Mobile, not desktop, will lead and user experience will be supplemented by machine learning to automate away not only the mundane for agents, but buyers and sellers. Antiquated tools that are not client-facing, are overburdened with unnecessary features, slow, and modular are bound to fail. Instead, technology that enables the agent, features a communication platform, intelligently integrates best-in-class tools, and is designed for consumers (think AirBnB) will win. Mike DelPrete, as discussed during an Inman Connect Panel, measures efficiency as the number of transactions per agent per year, and speaks specifically to the role technology plays in this equation. DelPrete argues that firms that can operate with less agents are at a competitive advantage. Should Compass start layoffs and stop acquiring brokerages? Technology in and of itself doesn’t provide value, especially in the real estate industry. The value-add of technology comes from the enhancements to the client experience. Would Uber be anywhere near as valuable if all the benefits from it’s technology accrued to the drivers? Staying local to the argument, judging technology’s value based on transactions/agent/year aligns value with quantity, not quality. Redfin’s business model differs substantially from traditional brokerages, and it’s crafted it’s technology platform to conform to that business model, not the other way around. This is an apples-to-oranges comparison, and as an aside, Redfin has yet to return value to it’s shareholders in the form of profits or positive cash flows, so these investments in technology have yet to be value-add to investors. I would argue that the vast majority of Redfin’s online traffic are casual browsers who do not end up using a Redfin agent. Zillow intelligently decided to monetize it’s traffic — so who is doing a better job as a company? When it comes to real estate, technology has a dual role: making agents more efficient and providing a better customer experience. It’s not about replacing agents or removing the insurance of having a specialist involved. This is where the incumbents — with their regular announcements of big technology plays — are at a disadvantage, and the newcomers have the advantage. What DelPrete is saying here is most firms have a challenging build/buy decision: few, if any, have the ability to build in house and build well, and most are left with tools that do not adequately meet their needs. Should Keller Williams invest in technology? Absolutely. Should they develop their own? Maybe. Early returns to Keller’s Kelli and others have been mediocre when it comes to delivering value to agents and their clients. Many I’ve spoken with at Keller get the flash, but the tools deliver little on value-add. Do real estate firms have an inherent conflict of interest? Does developing technology to become more efficient lead to reducing head count down the road? Would that head count in their technology back office be better spent on the service side, growing their business in their respective markets? The big U.S. real estate incumbents can’t stop talking about technology. Each week brings a new announcement about plans for new tech platforms, investments and initiatives. And though industry gurus love to talk about the impending perfect storm of technology that will revolutionize the industry, I think they’ve got it wrong and are repeatedly missing a key point. Loss aversion, as DelPrete points out, describes the psychological phenomenon that explains why humans are risk averse, meaning we do not view losses and gains of the same magnitude equally. More simply put, we would rather not lose money than gain it. 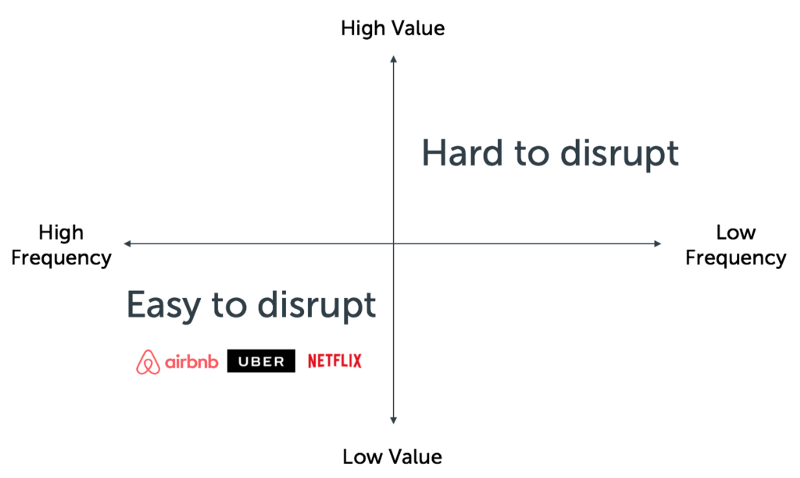 The relevant point is that when considering technology, humans are more likely to adopt less risky options where the downside is limited, which DelPrete describes as those that affect high-frequency, low-value events (such as choosing Uber over a cab, AirBnB over a hotel, and Netflix over cable) as opposed to low-frequency, high-value events (such as buying a home, where errors are extremely costly). Does real estate need a disruption? No. Real estate badly needs some large, but incremental, forward progress, keeping the agent at the center of the process. Even Zillow, who is now partaking in the iBuyer movement, refuses to cut ties to agents by passing these transactions to them and recognizing that while they’re solving a part of the problem, a high-risk and complex transaction still requires a knowledgeable guide. Does technology and high-touch client service need to be mutually exclusive? The tables have turned on all of these companies. In the first two decades of Internet innovation, sales agents paid billions of dollars — mostly in digital marketing — creating huge valuations for companies like Zillow and Realtor.comand funding the Software-as-a-Service (SaaS) industry. Franchises and many broker-owners made minimal tech investments. In phase two of the real estate information age, companies are being forced to invest big time in technology if they hope to recruit and retain the best agents. The key point Inman makes is that technology and high-touch service brokerages are not mutually exclusive, and in fact, the combination is now critical as clients demand both. These are the firms that are built for the future. Ignoring technology and assuming it’s an all-or-nothing and that firms who invest in technology will stop investing in their agents risk becoming obsolete quickly. This is a repeat of a decade ago when brokerages and MLS’s focused on retaining the keys to the lock that was safe guarding listing data, missing an opportunity instead to create Zillow themselves. Technology that was built with the brokers in mind first and consumers second was the genesis of the national portals. It’s About the Clients. That’s It. Ultimately, DelPrete is right to point out the necessity of technology, but defining “technology” as “things that will displace the agent” or “allow agents to do more transactions” is misleading. DelPrete would likely respond that he’s simply arguing new business models are going to create more efficient, lower-overhead firms. And he’s not wrong, but merely assuming displace-or-nothing is the only acceptable way to integrate technology into the real estate world is slightly misleading. The perfectly efficient brokerage, by his definition, will feature no agents, and confusing “efficiency” with “number of transactions” misses the most important point: it’s not about efficiency at all, it’s about delivering the best client experience, because in an industry that relies so heavily on repeats and referrals, that should be the only focus. Compass: Buy, Hold, or Sell?